EDMONTON – The Regina Pats fell 6-1 to the Oil Kings on Wednesday night at Rogers Place in Edmonton. The Pats got the game’s first goal when Riley Krane buried a shot from an impossible angle at the left goal line for his fourth of the year. Steven Zonneveld and Kyle Walker drew assists and the Pats led 1-0 eight minutes in. The Oil Kings found a tying goal with 13 seconds left in the period, Trey Fix-Wolansky with the goal and it was 1-1 after one. 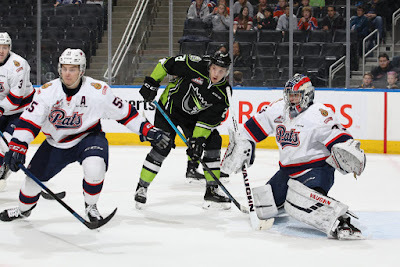 In the second, the Oil Kings scored once on the powerplay and once even strength to lead 3-1. They would add three more in the third and take the two points in a 6-1 final. The Pats were outshot 38-25. The powerplay was 0/3 and the penalty kill was 2/5. Max Paddock made 32 saves. - Steven Zonneveld picked up his second career assist in the contest. - Kyle Walker has assists in back to back games. - Riley Krane scored his second goal in his last six games. The Pats (8-21-0) continue their road trip on Friday night in Red Deer against the Rebels at 8 p.m. on 620 CKRM. The Pats next home game is Friday, December 14 against the Moose Jaw Warriors. Tickets are available at reginapats.com, the Brandt Centre Box Office and at any Regina Safeway, where Fun Zone tickets are $13 plus tax. No goaltending or defence last night. The remainder of this season is going to be tough to swallow.